Ah, the future. No, teh future. Nintendo seems to be milling over new wonders for its upcoming 3D-glasses-free game handheld. In Nintendo's regular Q&A with company boss Satoru Iwata, the honcho and Mario creator Shigeru Miyamoto were talking loosely about possible plans for the Nintendo 3DS. 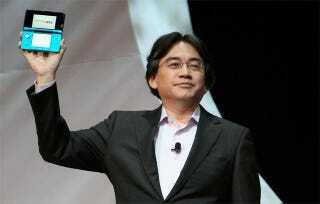 "In a future, improved version, I think it would be enjoyable if you were able to film video," Iwata told Miyamoto. Iwata did not clarify if, when and how this "version up" would appear. The 3DS is currently able to take 3D photos. 3D video seems like a logical step sometime in the near, hopefully, future for the handheld. No, whether Nintendo will include 3D video a new incarnation, a 3DS version of the DS Lite, that remains to be seen. Seen in 3D, that is.